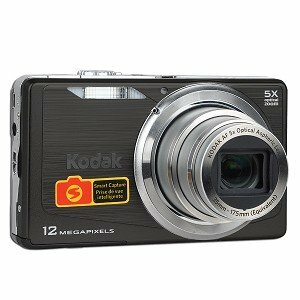 Unleash your creative picture-taking power with the help of this easy-to-use Kodak EasyShare MD81 digital camera!This Kodak MD81 digital camera features 12 MP (11.8 MP maximum selectable option on on-screen menu) so you get beautiful looking pictures, naturally! Get close up shots of your subjects with 5x optical zoom and get even closer with 5x digital zoom! With the blur reduction feature you can reduce blur caused by camera shake, subject movement, or fast-action situations making it ideal for sporting events and concerts!Get a good look at your pictures and preview them on the bright 3.0-inch color LCD! Become a better photographer by using the Smart Capture feature which automatically identifies the scene and adjusts camera settings for a great picture in just about any environment!With the MD81 you can take stunning Hi-Def pictures in 16:9 format and view your pictures in high definition on an HDTV or other Hi-Def devices (KODAK AV cable required, not included). Face detection makes it easy to catch those great smiles by locating faces and automatically adjusting camera settings!This EasyShare MD81 not only captures stunning images. You can shoot video with ease at 30 fps (VGA 640 x 480) and QVGA video at 30 fps (320 x 240), so go ahead and make a short video and post it on YouTube!Sharing is easy. Simply push the share button on the back of the MD81! With 32 MB internal memory and support for SDHC/SD cards, you can start capturing stunning images right out of the box! Order your Kodak EasyShare MD81 today!